It can be frustrating when users in your organization receive junk email or miss an important email because it was misidentified as spam. We're constantly fine-tuning the Exchange Online Protection (EOP) spam filters to be more accurate, and you and your end users can help with this process; Microsoft Outlook on the web users can report junk (spam) and phishing scams by using built-in email reporting options. You can also let Microsoft know if an email was incorrectly identified as junk (spam). Click on the junk message and then click Junk on the toolbar. This moves the message to your Junk email folder and adds the sender to your blocked sender list. Alternatively, right-click a message to display a menu, and click Mark as junk. A dialog box opens asking if you want to send a copy of the junk email message to Microsoft for analysis. Click report to send the message to the Microsoft Spam Analysis Team. 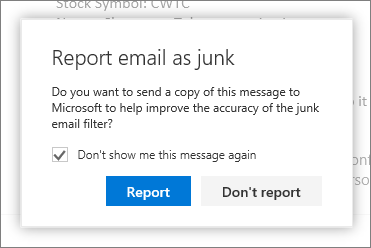 Optionally, select the Don't show me this message again check box if you want to automatically submit future junk messages to Microsoft without being prompted. Click on the phishing scam message, click the down arrow next to Junk, and then click Phishing on the toolbar. Office 365 does not block the sender because senders of phishing scam messages typically impersonate legitimate senders. If you prefer, add the sender to your blocked senders list by following the instructions in the topic Block or allow (junk email settings). Alternatively, right-click a message to display a menu, and click Mark as Phishing. You can report a phishing scam message from your Inbox, Clutter, or Deleted Items folder. For some organizations, a dialog box opens asking if you want to send a copy of the phishing scam email to Microsoft for analysis. Click report to send the message to the Microsoft Spam Analysis Team. This reporting option is currently available to a limited number of organizations; you might not be asked to report a phishing scam to Microsoft. In your Junk email folder, click on the message and then click Not Junk on the toolbar. This moves the message to your Inbox and adds the sender to your safe senders list. You can also right-click on a message in your Junk mail folder to display a menu and click Mark as not junk. A dialog box opens asking if you want to send a copy of the not junk email message to Microsoft for analysis. Click report to send the message to the Microsoft Spam Analysis Team..